If there has been any review from this weekend I have found tough to write, it’s this one of The Dark Valley. The plot is good, the acting is strong, and the team behind the camera sets a great tone and scene for the audience. The reason it must be so difficult to write about pertains to how complex this movie really is under a guise of a basic foreign western. 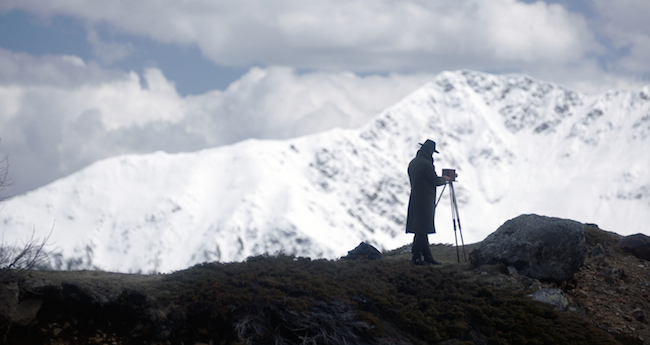 The Dark Valley has a strong narrative that tells the story of a stranger (Sam Riley as Greider) who finds his way to a small, hidden town in the Alps. Looking for board for the winter, he pays the town’s self-appointed guardians, Brenner (Hans-Michael Rehberg) and his six sons, a large sum of money. Reluctantly, the Brenners allow the stranger to stay and collect photographs of the valley with his magic box. Shortly after he is put up with Luzi (Paula Beer) and her mother, Luzi begins asking questions to try and learn more about the mysterious stranger. Things slowly unravel at their own pace, though, and the many questions that arise are all eventually answered. Although calling The Dark Valley a movie with a happy ending might be a stretch, it still has a very organized and complete closing compared to most films I saw at this year’s Tallgrass Film Festival. Basically, the hero does ride into the sunset, but, in this instance this romanticism doesn’t take away from the realism or dark mystery littered throughout this movie. 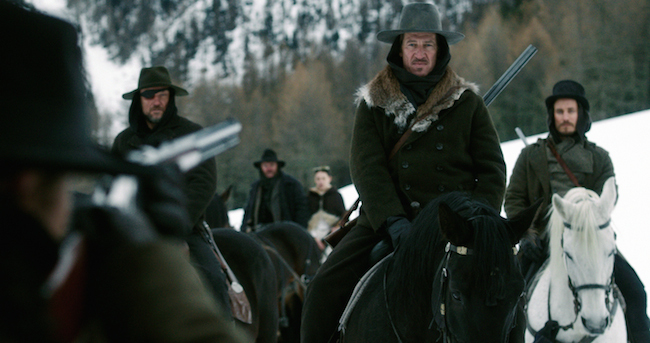 The Austrian/German film is a bit western, mystery thriller, and a few other genres rolled into one. The mysterious ties of the Brenner family, the reason for Greider’s visit, and the suspense around Luzi’s wedding all drive the plot in this slow burner. Even keeping so much deep-rooted mystery, this film is very suspenseful. It may not give you much, but it gives you enough to try and figure some things out. There is clearly a motive to Greider’s visit beyond taking pictures, but the movie doesn’t slap you in the face with it and The Dark Valley treats its audience with a fair amount of respect from start to finish. The strong acting helps make this experience very enjoyable. Sam Riley and Paula Beer get the majority of the screen time, but the cast that fills the town around them play crucial roles in the unfolding story. Riley’s performance helps sell the entire thing. Key changes in emotion throughout progress the plot, allowing for others in the film and in the audience to be keyed into more. I was once again blown away by what I would consider an accurate set. The quality of the homes and town buildings appear to fit in the right period. The tools and weapons are key indicators of the setting while costumes, behaviors, and, of course, the camera are all enough to give you an idea of when this story takes place even without ever really being told. I have been very mysterious in this review of The Dark Valley, but such is intentional. Too much information, even about the themes or aforementioned genres, would give away the entire point of the movie. The film isn’t a life-changing event, but it is a good, fun movie with strong acting, great directing, and a team that did an incredible job on set. It’s unclear when this movie will be more widely available stateside, but when it does finally make that journey, The Dark Valley is worth visiting.